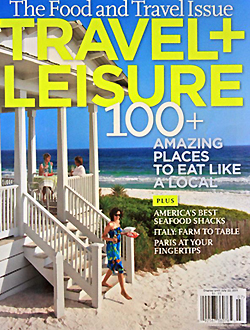 Seaside is on the cover of Travel + Leisure with a beautilful shot of the Seaside Pavilion. The Shrimp Shack restaurant in Seaside made the list of America’s Best Waterfront Seafood Shacks. Check out the web story here and go to #11 to see a close up shot of their yummy peel-and-eat Gulf shrimp basket. You can also click here for the highlights of the magazine article – PDF. PICTURE YOURSELF IN SEASIDE. Now booking for the remainder of the summer, fall, winter and 2011. Click Here to make a reservation or call us toll-free at 855-299-1314.